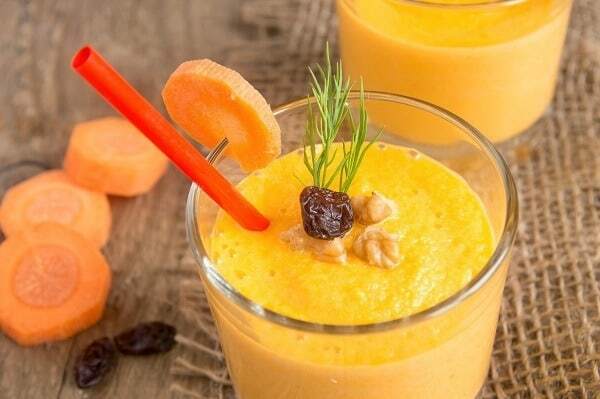 If you’re looking to lose weight, orange smoothies could be your new secret weapon! The fiber and low calorie content are perfect for creating weight loss friendly smoothies, especially when they are combined with other ingredients that help you to lose weight. Oranges are well known for their vitamin C content, which makes orange smoothies a great choice for improving your immunity. What you may not realize is that they are also a good source of other key nutrients so they’re a great all round smoothie ingredient for better health. 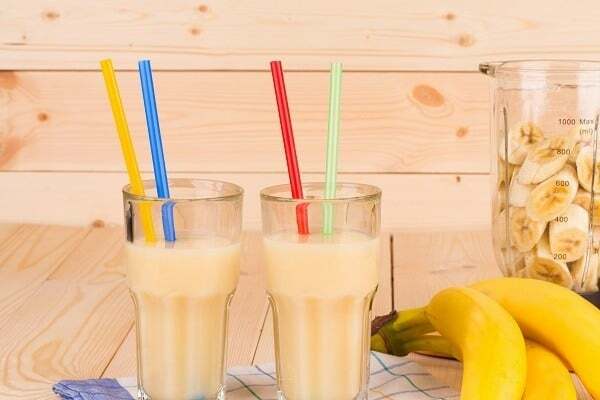 Whether you want a breakfast smoothie to see you through the morning or a mid afternoon snack to keep you full until dinner, these recipes are sure to be a hit. Whatever the occasion, we’ve got you covered! 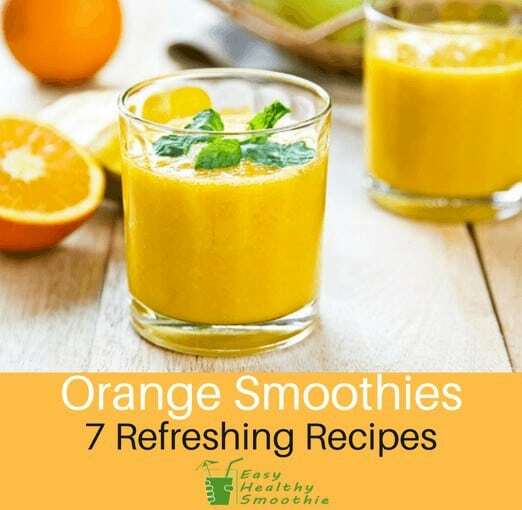 Read on for some delicious and healthy orange smoothie recipes. Are orange good for diabetes? Are oranges high in potassium? Are oranges high in calcium? Are oranges high in iron? Are oranges high in phosphorus? Are oranges safe to eat in pregnancy? This smoothie makes a filling breakfast smoothie, largely due to the fiber and protein content. It’s light but satisfying and should keep you full through the morning. We’re using soy milk here for an extra boost of protein and other nutrients but you can swap it for nut milk or another type of milk if you prefer. Hull the strawberries and peel the orange. 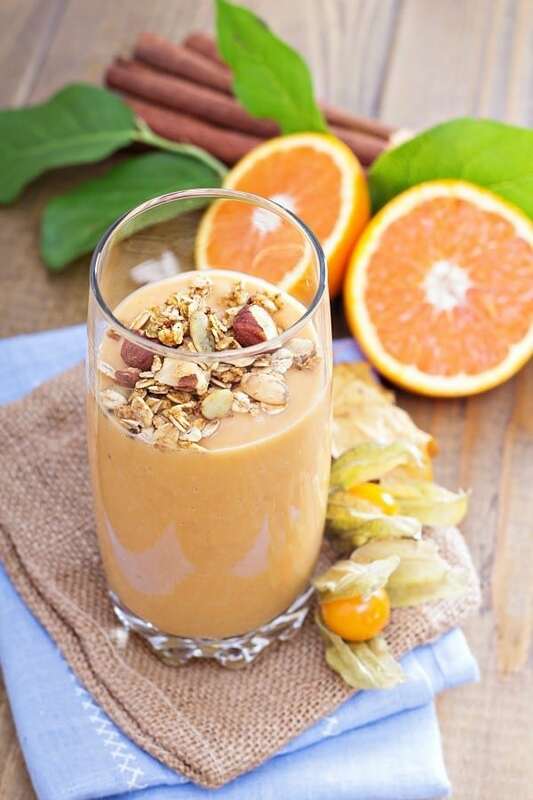 The apple and orange combination in this smoothie make it weight loss friendly. It’s packed with both soluble and insoluble fiber but doesn’t contain a lot of calories. They’re also great for cholesterol and are loaded with antioxidants that help to reduce “bad” LDL cholesterol and protect your body from the effects of free radicals. Not bad for such a simple smoothie! Peel the apple, orange and banana. Cut the apple and banana into pieces. Add the apple, orange and banana to the blender. There’s plenty of fiber and protein in this easy smoothie. If you want to add even more nutrition, try using a handful of spinach too. If your blender isn’t powerful enough to blend ice, swap out the ice cubes and use frozen banana instead. This smoothie is packed with vitamin C and there’s plenty of protein included too. It’s deliciously sweet thanks to the vanilla and super creamy too thanks to the addition of greek yogurt, which is high in saturated, easy to digest fats. Peel and slice the orange and banana. If you want to get your vitamin C boost in a smoothie, this is a great choice. We often associate vitamin C with immunity but it can also give your eyesight a boost thanks to the beta carotene found in carrots. 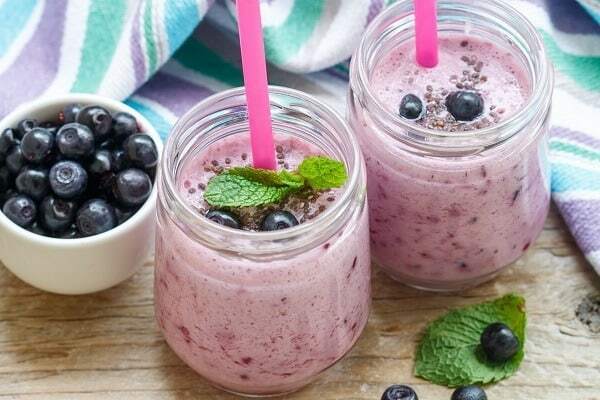 There are so many nutrients packed into this smoothie, not least antioxidants from the blueberries, vitamin C from the orange and healthy fats and vitamin E from the avocado. Peel and slice the banana. Peel and pit the avocado. If you wouldn’t put orange and greens together, you’ll be pleasantly surprised by this smoothie. It combines orange and spinach (or another green if you prefer), plus celery for another dose of greens and papaya for a tropical twist. Peel and slice the orange. Chop the celery and spinach. 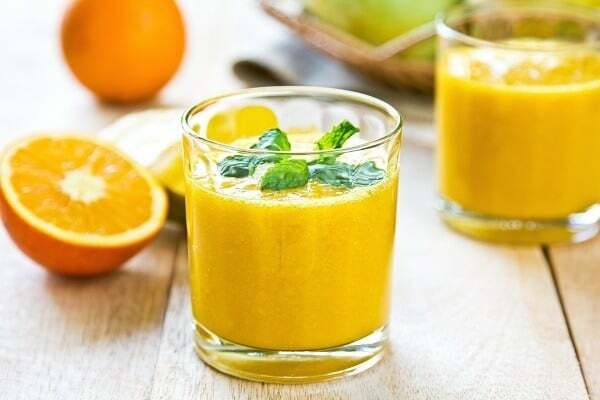 If these recipes have got you excited about using oranges in your smoothies, no doubt you’re keen to learn more about the nutritional benefits? Find out the answers to some of the common questions about oranges. Oranges rank low on the Glycemic Index (GI) scale and are perfectly okay to eat if you have diabetes. In fact, the American Diabetes Association recommends oranges as a diabetes superfood! Technically, oranges are an acidic fruit but the amount of acid that they contain can depend on where they have been grown. Their acidity is linked to their ascorbic acid content, which you probably know better as vitamin C.
This is a bit of a grey area though as orange juice also has an alkaline effect on the body (as do citrus fruits in general). To get this effect, it needs to be completely pure orange juice with no preservatives, sugars or other add-ins that could change the situation. If you can get it, organic orange juice offers the most alkalizing benefits. Your body needs potassium for maintaining a regular heartbeat and making sure that your muscles work properly. Certain foods are a good source of that and although oranges aren’t a well known example compared to some other foods, they can provide a good boost of it. The National Kidney Foundation classes oranges as a high potassium food as they have more than 200mg of potassium per ½ cup. Likewise, the US Department of Agriculture also highlights the potassium content of oranges. You can boost your potassium intake even more by using banana in your orange smoothies. You may not think of oranges as a source of calcium but it’s actually a fairly good source. Adding oranges or orange juice to your smoothies is an underrated way to get a bit more calcium in your diet. The National Osteoporosis Society describes oranges (and orange juice) as a calcium rich food, as long as it has been fortified. Oranges provide 55 mg of calcium, while 8 ounces of orange juice provide around 300 mg of calcium. This won’t provide all of the recommended 1000 mg of calcium you’re recommended to get each day but it definitely helps you on your way. Oranges aren’t a great source of iron so if you don’t feel that you’re getting enough in you diet, you’ll need to add some iron rich sources instead of relying on oranges. 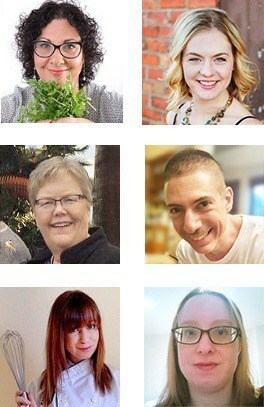 Leafy greens such as spinach can increase your iron intake, as can pumpkin and sesame seeds, cacao, maca and spirulina. The vitamin C content in oranges can help more iron to be absorbed, especially from plant based sources. Oranges contain some phosphorus but they aren’t a particularly good source. According to the US Department of Agriculture, oranges contain around 12 mg of phosphorus. This is only a small part of the 700 mg that you’re recommended to get each day. 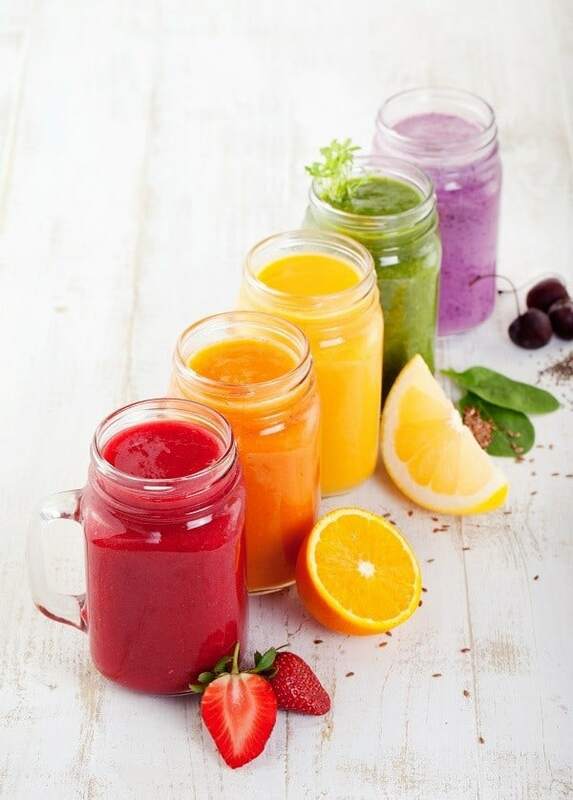 Adding other phosphorus rich ingredients to smoothies can boost your intake. Cashew nuts are an example of this as they have almost 600 mg of phosphorus in comparison. It’s perfectly okay to eat oranges and drink orange juice while pregnant and there are a few reasons why you might want to sip on orange smoothies when you’re expecting. It’s recommended that you eat plenty of fiber during pregnancy to prevent constipation, and oranges are a great source of this. Their vitamin C content also comes in handy too, as pregnant women are advised to get 10 mg more of it. The potassium content helps to lower blood pressure and protects against the dangers of high blood pressure during pregnancy. If you drink orange smoothies during pregnancy, it is best to avoid including certain ingredients including papaya and pineapple. Papaya is often advised against in the latter stages of pregnancy as it can bring on uterine contractions and the bromelain in pineapple may have similar effects for some pregnant women. As you can see, there are lots of ways that you can use oranges and orange juice in your smoothies and reap the benefits of the vitamin C, potassium and calcium content. I really hope you have enjoyed reading this and learning about some delicious and healthy orange smoothies. I’d love to know which one is your favorite. Comment below with your thoughts on these recipes and let me know which one you plan to make first! Please feel free to share this article with your friends and family so that they can discover more about superfood orange smoothies too.